Apply Now for the Bonnie W. Oldham Library Research Prize! Leave a comment on Apply Now for the Bonnie W. Oldham Library Research Prize! The application deadline for projects completed during Intersession or Spring 2019 is Monday, April 29, 2019 at 4:00 pm. Winners will be announced at the end of the Spring 2019 semester. Leave a comment on Game Night This Thursday!! 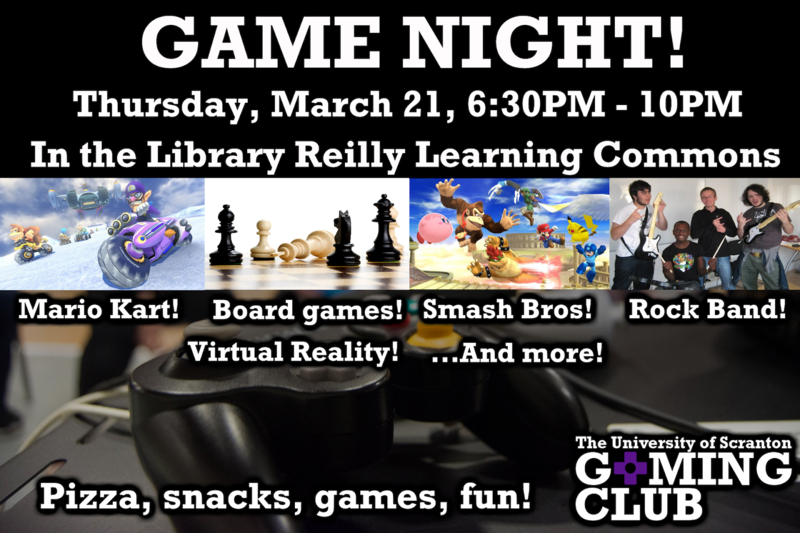 The Library will be hosting a Game Night in the Reilly Learning Commons on Thursday, March 21st from 6:30-10PM. Some of the games available are MarioKart, Super Smash Bros., Rock Band, Just Dance, and a variety of new and exciting board games! Have games of your own? Students are encouraged to bring their favorite board games and card games to enjoy with friends! Free Pizza, Soda, and Snacks will be provided! All students are invited to join in the fun! Comments Off on Apply Now for the Bonnie W. Oldham Library Research Prize! Comments Off on Game Night this Thursday! 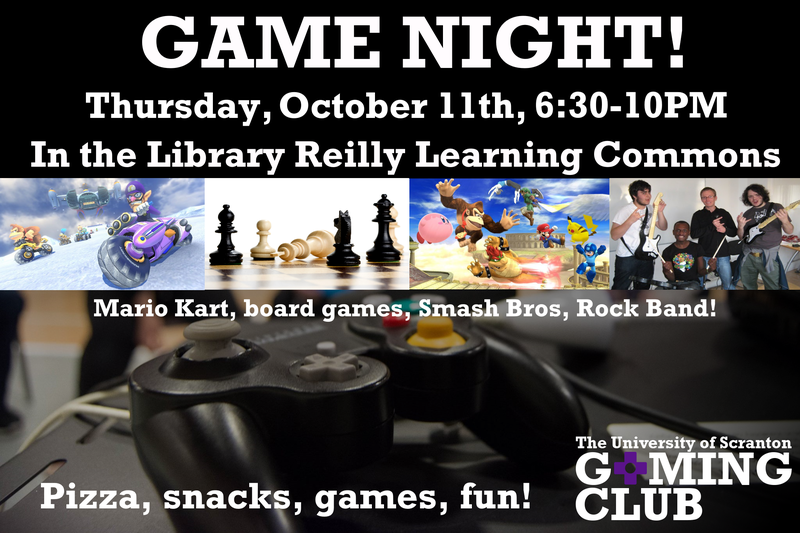 The Library will be hosting a Game Night in the Reilly Learning Commons on Thursday, October 11th from 6:30-10PM. Some of the games available are MarioKart, Super Smash Bros., Rock Band, Just Dance, and a variety of new and exciting board games! Game Night on October 11th! Comments Off on Game Night on October 11th! New this year: Three prizes of $500.00 each will be awarded to the winning individual student and/or group in the following categories: Undergraduate Foundational (100-level courses), Undergraduate Upper-level (200- to 400-level courses), and Graduate. If won by a group, the award will be split equally among the group members. All you need to do is write a 500- to 700-word essay describing your research process and how you used the library in completing the project. Click here for some tips on how to craft the best 500- to 700-word essay you can about your research. The application deadline for projects completed during Intersession or Spring 2018 is Monday, April 30, 2018 at 4:00 pm. Winners will be announced at the end of the Spring 2018 semester. Library Game Night on Thursday! Comments Off on Library Game Night on Thursday! 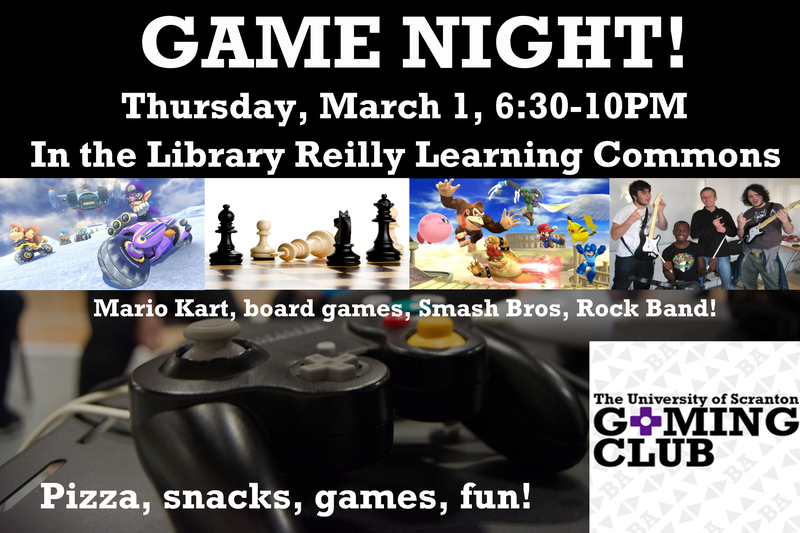 The Library will be hosting a Game Night in the Reilly Learning Commons on Thursday, March 1 from 6:30-10PM. Some of the games available are MarioKart, Super Smash Bros., Just Dance, Rock Band 3, and a variety of board games.